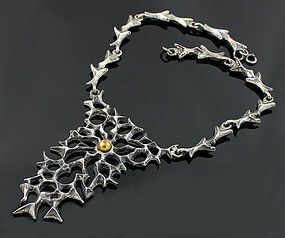 Early American modernist brass and silver necklace made by Betty Cooke, c.1940s. Early example of Betty's work. Excellent condition and all original. 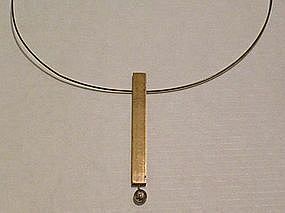 Measures 7 1/4" long, pendant alone - 2 1/2" x 1/4". 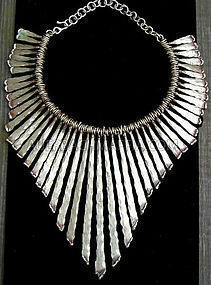 Robert Larin - modernist sculptural pewter necklace. Pendant - 4" long. Necklace 5" x 5 1/2" in diameter. 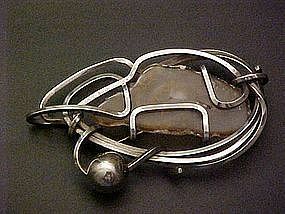 Hans Hansen modernist sterling brooch. Dimensions - 3 1/4" long x 5/8" at widest point. Measures 16 1/2" when outstretched, drops measure 1 3/4" long. 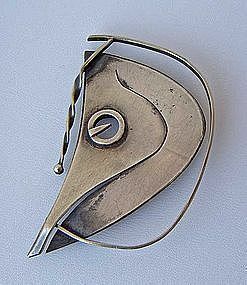 William DeHart - rare American modernist sterling brooch. Brooch measures 3 3/4" x 4". DeHart exhibited at The Walker Art Center mid 20th century. 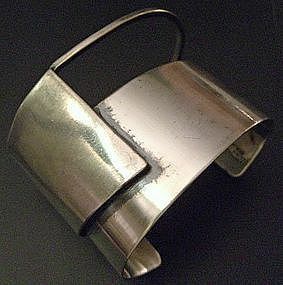 American modernist sterling cuff made by Ed Wiener, c.1950s. Excellent condition and measures 2 1/4" wide. 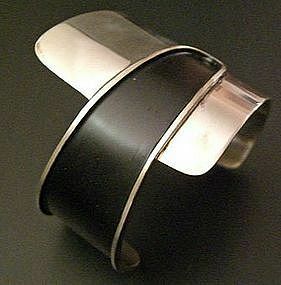 American modernist sterling cuff bracelet made by Frank Miraglia, c.1950s. The cuff is in excellent condition and measures 2" wide. 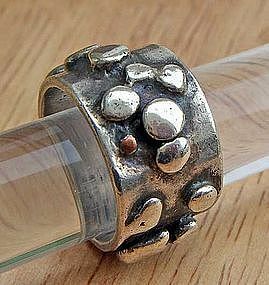 Modernist sterling and copper ring by Jim Hayes - Aspen, Colorado. 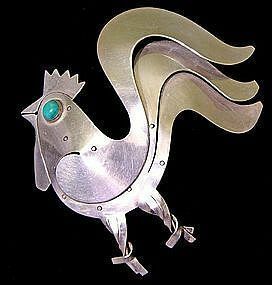 Paul Lobel figural sterling brooch. Rare form from this early modernist artisan. Measures appx. 2 1/4" x 1 1/2". 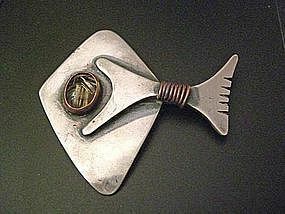 Ed Wiener modernist abstract fish pin, c.1950s. 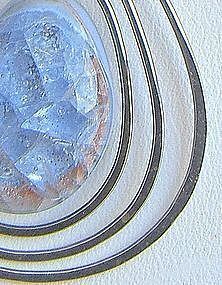 The pin is made of sterling silver with copper bezel and coil with a rutilated quartz. The pin is in excellent condition and measures 2 1/2" x 2 1/8". 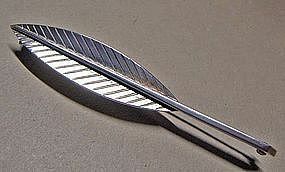 Sterling silver pin made by Paul Lobel, c.1940s. 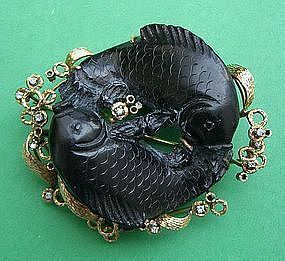 Entitled "Stradivarius",this brooch is in excellent condition. 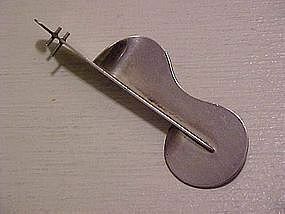 Ronald Hayes Pearson large modernist sterling pin. c.1950s. The pin is in excellent condition. 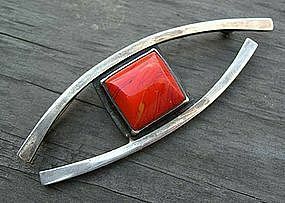 Henry Steig modernist brooch with stone. Measurements - app. 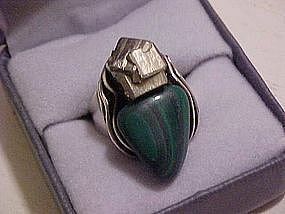 3" long x 1"
Sterling silver ring with two types of stones personal made by Rebajes hand, c.1950s. The ring is in excellent condition and very clean. 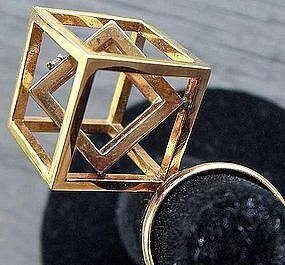 The ring is adjustable for size. Showing is a size 5.